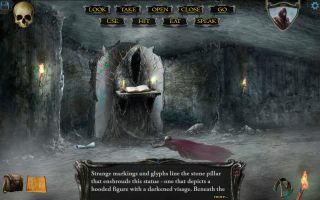 Shadowgate was a brutally-hard Mac (and later NES) adventure game, where one failed puzzle could murder you and force you to start all over. The remake that Zojoi Studios has coming updates those visuals for the modern age, but keeps the puzzles difficult and the atmosphere dark. When I spoke to developer Karl Roelofs last month about the game's progress, the team still wasn't sure about its release date. Now that date is set, and Zojoi has exclusively revealed it to us, along with a trailer that shows off Shadowgate's commitment to its history. August 21 is that date, when Shadowgate will launch on Steam for the PC. It's also the date when modern gamers will realize just how difficult puzzle-adventure games of this type were back in the good old days. I've played a few hours of Shadowgate's beta build, which challenges you to enter the "living" Castle Shadowgate and defeat an evil warlock using only your wits and whatever you can find inside, and it does not mess around. Choosing the wrong path means instant failure, though thankfully this new version is much more generous with your save game options. It also includes new difficulty levels that simplify the puzzles, if the faithfully reproduced dangers are too much for you. Staying faithful to the original is what this new trailer is all about. It shows side-by-side comparisons of Castle Shadowgate from the NES original and the new reboot. For even more info, read my chat with design director Karl Roelofs, where we talk about the process of bringing Shadowgate back to life .